Takes 24 to 36 hours to full cure and reach maximum strength. Handles in 1 to 2 minutes. Dries clear. Remains flexible. Works where others won't! 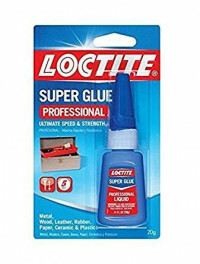 Flexible Fly-Tying adhesive. Excellent Sealant. 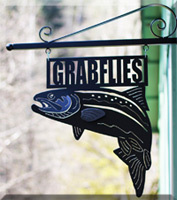 Use for gluing on eyes or patching your waders. 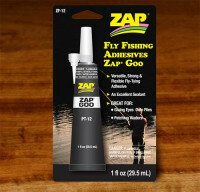 Zap-a-Gap Super Glue: Cyanoacrylates adhesive that fills gaps. Allows 7 to 10 seconds for positioning. Cures in 20 seconds. Bonds anything, even oily surfaces! Water proof, incredibly strong in very small amounts. Used for attaching lead wire, eyes and many other applications including on-stream repairs. Zap-A-Gap is completely water proof. Zap-A-Gap dries fast. It takes about 10 seconds to dry. Zap-A-Gap comes in a small plastic tube. The top locks tight and won't spill or leak. 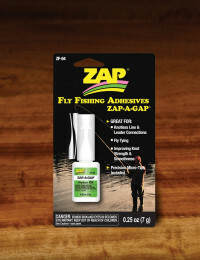 Zap-A-Gap will stick to any non-greasy, porous material. Bonds made with Zap-A-Gap are very strong. Always use less than you think you'll really need.